To enrich the Chico Experience by supporting alumni, students, and the University to ensure a lifelong connection and enduring legacy. To excel as an alumni organization of distinction. The Chico State Alumni Association is committed to promoting inclusiveness and diversity through our alumni engagement, board recruitment and retention, and our service to the students and alumni of Chico State. The Chico State Alumni Association Board of Directors will work together as a group of diverse individuals to find innovative and inclusive ways to reconnect alumni to Chico State and the Chico Experience. The Chico State Alumni Association is a program aimed to link alumni, students, and the University. 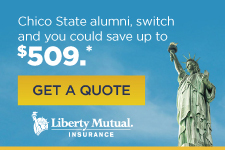 As an alum of Chico State, you are automatically part of it! The Chico State Alumni Association restructured its programming in 2015 and is better than before. True to the Chico Experience, the association is different from what many other universities offer, and ensures a lasting connection to the beautiful Chico State campus and the students whose lives it changes. NO annual dues. Everyone is a member. No more worrying about paying dues year after year. Instead, we are channeling our efforts to provide you with valuable programming. Even better, alumni still receive special benefits and communications. EVERYONE is a member. It isn’t just for alumni anymore. It’s for the whole Chico State family—alumni, students, faculty, and staff. We joyfully welcome students, our future alumni, as a part of our family on their first day on campus. The traditional idea of a members-only club no longer fits at Chico State, and we know alumni are hardly alone as passionate supporters of the University. So we’ve decided to go all in, expand the association, and focus on providing services of true value to our alumni. Strengthening our CONNECTIONS with each other. Showcasing PRIDE for Chico State. Spreading SUPPORT of Chico State through volunteering, advocating, and giving. Learn more about the association and become an alumni member today.